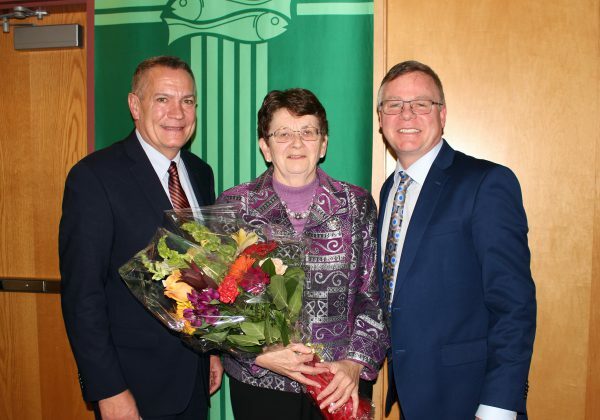 The Board of Trustees and CDSBEO administration honoured Lanark County Trustee Nancy Kirby, on what was her final board meeting with the CDSBEO. Trustee Kirby has served for 24 years as a Catholic School Board Trustee, first with the Lanark Leeds and Grenville Roman Catholic Separate School Board, and then with the CDSBEO beginning in 1998 after amalgamation. Trustee Kirby chose not to seek re-election in the October 22 municipal election. Trustees paid tribute to Trustee Kirby with reflections on her many accomplishments. 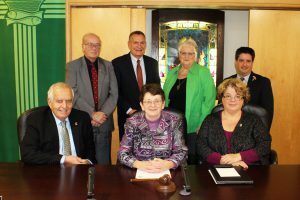 Trustee Kirby served as Vice-President of the Ontario Catholic School Trustees’ Association from 2008 to 2010, when she was then elected as President, serving until 2012. She served as Chair for the Lanark Leeds and Grenville Roman Catholic Separate School Board and CDSBEO from 1997 to 2000, and as Vice-Chair for the CDSBEO from 2003 until 2009. Trustee-elect Jennifer Cooney, who was acclaimed at the October 22 election, will be sworn-in at the Inaugural Board Meeting on December 4, 2018.